This one’s like cheesecake on a stick. 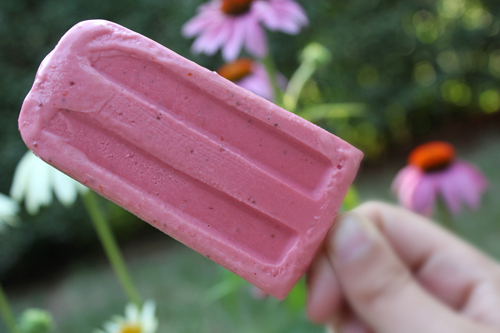 The “Creamy Strawberry Lemonade Popsicle,” from Good Life Eats, freezes soft -- like ice cream -- rather than icy. Notice the ingredient that does the trick, here: cream cheese. Really! This is what pulled me in. The frozen strawberries, lemon, sugar, and yogurt were standards in the popsicle realm, for me. But cream cheese? Crazy. My regular blender had no problem with this mix of ingredients. I put my room-temperature cream cheese and yogurt in the blender first, then topped them with the warm, syrupy, sugary, lemony, strawberry stuff. They blended without a problem. I even tossed in 1/2 cup of confectioners’ sugar. Here’s a little trick I’ll tell you about: to make “vanilla Greek yogurt,” I added 1/2 tsp. vanilla paste to my plain Greek yogurt. Easy. Enjoy this lemony/strawberry treat, with its lovely, creamy texture. Stand by for more summertime pop-ups soon.